Knife Cold Steel Swift I(22A) High quality Cold Steel knives, throwing knives, tactical knives. The Cold Steel Swift I is a sleek, fast and good looking assisted-opening folder designed by custom knife maker Andrew Demko. Featuring patent pending Flash-Tek technology, the Swift has the astonishing speed and smoothness of an assisted opening knife, but with the strength you have come to expect from Cold Steel and from Andrew Demko! The Swift I features a two-tone, satin polished, beautiful blade manufactured from American CTS XHP Alloy and honed to a fine cutting edge. The modified spear point has a pronounced recurve on the spine, which not only reduces the knife’s profile when closed but creates a comfortable and functional finger or thumb ramp for detail and precision work. 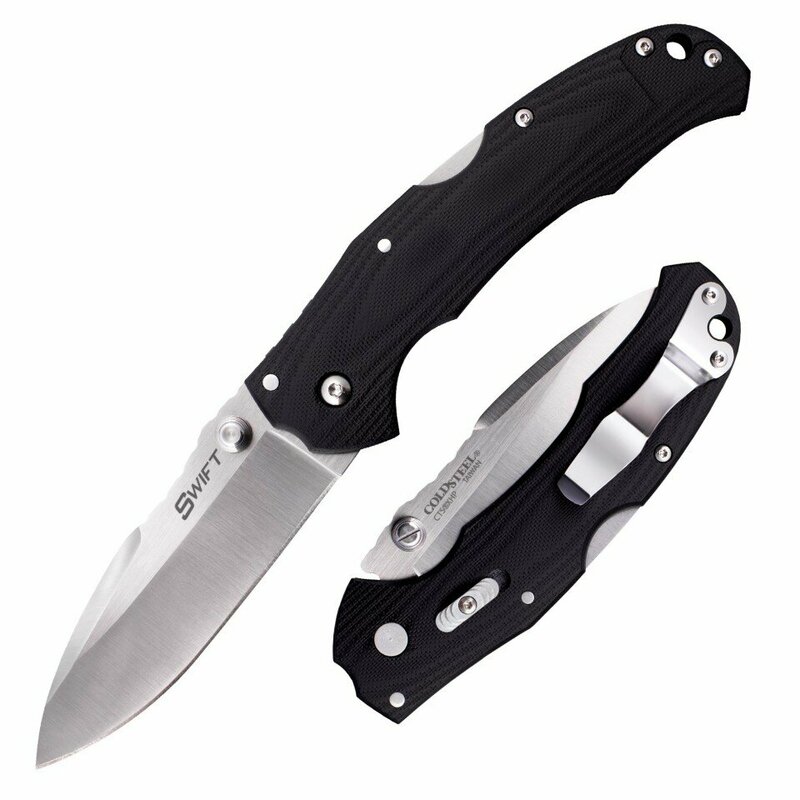 The Swift also features ergonomic 3-D CNC machined and bead blasted American G-10 handles that are a joy to hold and easy to use, with or without gloves. NEW FOR 2016 - our “XS” (Xtra Safe) safety keeps the blade securely locked when closed, while also acting as a secondary locking feature for even greater levels of strength when open! This incredibly comfortable, lightweight and fast action folder is sure to become a much loved every day carry choice!